Well Established Apparel Sourcing Organisation based in Tirupur & Chennai having a business of more than hundred million USD per annum. A complete vertically integrated set up starting from Yarn Manufacturing to Dispatch unit, supplying to major Global Brands all over the world. From Developing Knits and Textures to refined understanding of Fit and Drape, adopting International Styles, we always lead as an example. We have wide range of suppliers operating at various cost margin and we follow scientific cost leveraging techniques like Post & Pre Budgeting. 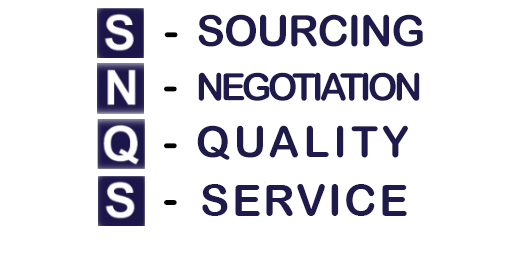 SNQS Group of companies as an organization delivers quality right across the textile value chain, based in Tiruppur, the textile capital of India. The group has carved a niche on its own as a quality conscious manufacturer of apparel goods that has found acceptance across the globe. With completely integrated manufacturing facilities our factories are equipped to meet any requirement. We Provide 360 Degree Solutions to our Clients, From Product Development to Logistics we take care of each and every step of Apparel Production. We have a top-notch team of in house designers for innovations in design and development. They constantly update themselves with the latest trends happening in the fashion world. Our team and systems ensure that products are delivered on time. As soon as an order is confirmed, we streamline the factory proceedings to shorten lead time. We constantly update our technology to meet global standards, while in parallel we also update our workforce with the latest technologies followed around the globe, saving time and cost.